You’ve heard the saying,”Women are from Venus, men are from Mars.” Sometimes it really feels like men and women were birthed, raised and inhabited completely different planets! Because of our differences, there are days when it takes every ounce of strength to stop arguing with your husband, doesn’t it? And what are the arguments about? Sometimes it’s the little things, but other times it’s more serious decisions that husbands and wives have a very difficult time seeing eye to eye on. You think your kids should be home-schooled, he wants them in public school. You think the kids should eat more whole grains, he thinks the kids should enjoy his childhood memories of processed fish sticks and Spaghettios. Ah, so is the married life! It takes a committed wife to determine in her heart that she will avoid arguments with her husband. It takes self-control, prayer and lots of patience. It also takes a listening ear and an understanding heart. If you truly desire to stop arguing with your husband — or at least keep disagreements at a minimum — then this article will give you a head start with honest, open and heart-to-heart advice. Let’s put an end to these arguments, shall we? 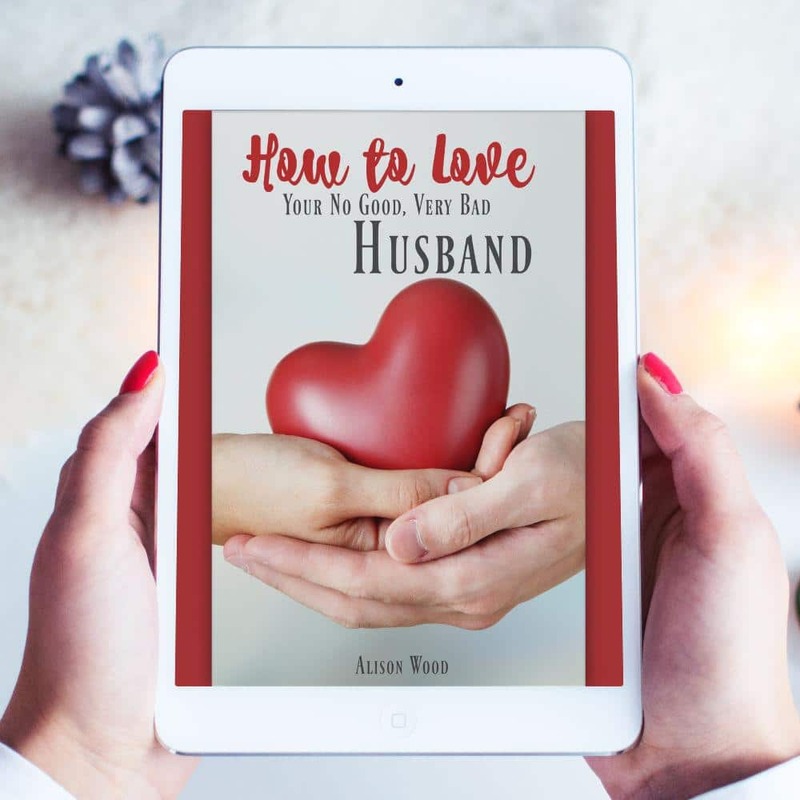 Oh and if you want to dig DEEPER into your marriage and learn how to re-ignite or just fan the flame of your love for your husband, I’ve got the perfect book for you that has daily marriage challenges! It’s not a quick-fix, but it’s a dedicated, purposeful decision to love your husband daily — even if he’s a no good, very bad husband! 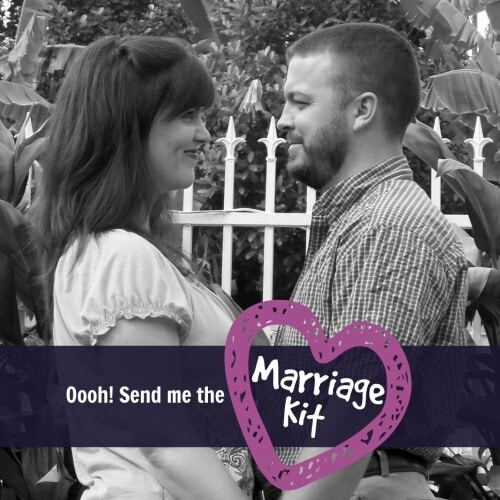 And if you want to grab a HUGE kit of marriage resources at no cost to you, you can grab our free marriage kit below! Hope you enjoy cultivating a happier, spicier and more loving marriage that’s truly a tiny piece of heaven on earth. 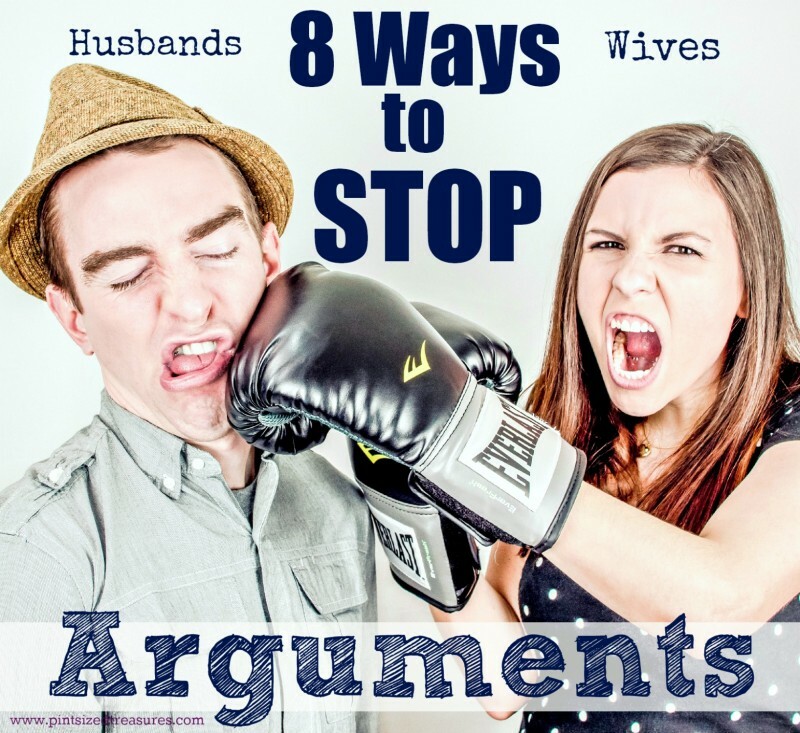 Ready to find out EXACTLY how to stop arguing with your husband? Listen to your husband. Many times we women have a habit of interrupting our friends, family members and especially our husbands. We get excited about something and can’t wait to share it! Other times we are only half-listening to our husbands. Even worse are the times when we are so convinced that ww are right that we completely stop listening in order to plan our powerful rebuttal. Even if your husband has a contrary opinion, take the time and reallylisten to him. Many times my husband has brought out some very good points on touchy subjects that I would have missed if I didn’t simply listen. Don’t assume the worst. Is your husband late coming home from work? Don’t assume he was out doing things he shouldn’t. Hey, maybe he was buying you some flowers — it’s possible! Does he want to skip dinner? Don’t be quick to think he doesn’t enjoy your cooking. He really may be too exhausted to eat. We women pride ourselves in being mind-readers, but let’s be honest — we CAN’T read other people’s minds — especially our husband’s! Think before you speak. In your other relationships you are probably slower to speak than in your marriage. It’s so easy to just say any and everything that flies into our minds! Take time to examine your thoughts before you respond or discuss a sensitive subject with your husband. Once the words are out of your mouth, they will never return. Much damage and hurt has been done through cruel, harsh and angry words. Follow the age-old saying, “If you can’t say anything nice, don’t say anything at all!” This is a great saying that I teach my kids — but it’s also very applicable to marriage. So many arguments would be prevented if we kept our critical remarks to ourselves. Your husband will have enough cold-hearted, negative comments hitting him from relatives and co-workers. He doesn’t need it from you too. Don’t be mad at the same time. My great-uncle told me this bit of advice before I got married. In fact, it was the only bit of advice he gave me about marriage. If you focus on staying calm when your husband is angry, it is much more difficult to become engaged in a heated argument. On the same hand, when you are growling and snarling, it sure does help if your hubby is in a good mood! Remember that bit of advice from a man that was happily married for many years. Post that saying on your fridge or your mirror to give you a little reminder every single day! Don’t withhold intimacy. So many wives brag about how they turn their husband’s sexual advances away during arguments. That will definitely not help the situation. In fact, if you want to stop arguments before they start, keep intimacy frequent and alive! Pushing your husband away will only harden his heart. Real marriages don’t work like the Hallmark and Lifetime movies portray them. Don’t believe me? Check out these lies the romantic movies tell wives. Most men don’t chase after a pouting woman. Real marriages need two humble, tender-hearted people that share affection constantly. Take away the gentle touches, soft kisses and passion, and what do you have left? Two hard-hearted people that are prone to argue. Don’t sweat the small stuff. He leaves his shoes in the living room. He invites friends over at the most inconvenient times. He forgets special plans. He rarely says “thank you” for home-cooked meals or a clean home. Those things are really minimal. Instead of focusing on his small misdemeanors, why not focus on his positives? Focusing on the small annoyances will only tempt you to open your mouth and start an argument. Don’t do it. It’s not worth it. Be the first to say, “I’m sorry.” Many arguments between a husband and wife involve two wrongs. Yes, maybe one spouse majorly messed up, but the other one may have over-reacted as well. If you have done ANYTHING wrong in the situation, be willing to apologize first — before the discussion gets out of hand! A happy marriage takes hard work! 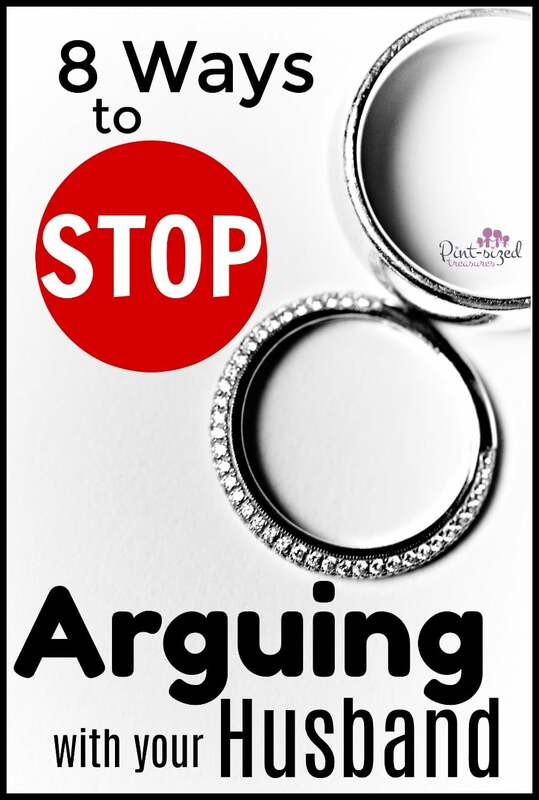 Commit to stop arguing with your husband so you can create a happier home for your family! A strong marriage creates a solid foundation for a happy home. Love, listen and apologize today for a marriage that is full of wonderful memories! How do you prevent arguing in your marriage? I would love to hear what works for you on our Facebook page! Psst! If you’d love more daily challenges for your marriage, home and family, hop on over and check out my ebook 25 Days to a Happier Home! It’s honest, mom-to-momve advice to help you cultivate a happier home with 25 daily challenges! Be sure to read the reviews to see how other homes were changed!